Cats and Internet are like inseparable best friends, the moment you log on to the Internet, there is a fat chance that you will see something with paws; purring and doing ridiculous things. This careless and fun nature of cats makes them irresistibly cute and an easy subject for movies. It is one of the reasons that over the decades Cats have played significant roles in numerous projects from the mighty animation studios. Leaving a long trail of pawprints since the rise of the Computer Generated Imagery (CGI). It is estimated that by the end of this century, cats will claim their rightful throne to the superior species making us human serve as their laugh-stock. Jokes apart, here is a list of 30 most famous cartoon cats that took a one way to our hearts. 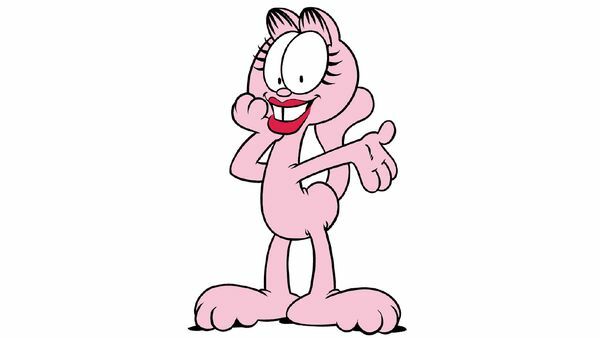 Arlene is a popular Garfield character with Pink fur, a long frame, and three-toed limbs, she wears red lipstick and for some time in comic strips had a big gap in between her two front teeth. Arlene is known to be Garfield’s love interest and she has made significant appearances in several comic strips, animated feature films, and CGI movies. She made her first appearance in the 1980’s, which was a very active year for her when she appeared regularly in the strips. Her appearances are rare now but it was made sure in the last year’s comic strip that it’s reoccurring. If you have seen the little blue people of the Smurf village, you must be familiar with the threat they face in the name of the malevolent wizard Gargamel & his pet cat Azrael. Accomplice to Gargamel’s criminal activities Azrael is no ordinary cat; who helped him kidnap and harm the peace loving smurfs number of times. Azrael is the smarter one of the antagonist duo. Gargamel doesn’t really acknowledge what he does and often mistreats him. There were times when Azrael turned against him in order to teach him a lesson but to nobody’s surprise Gargamel ceased to. 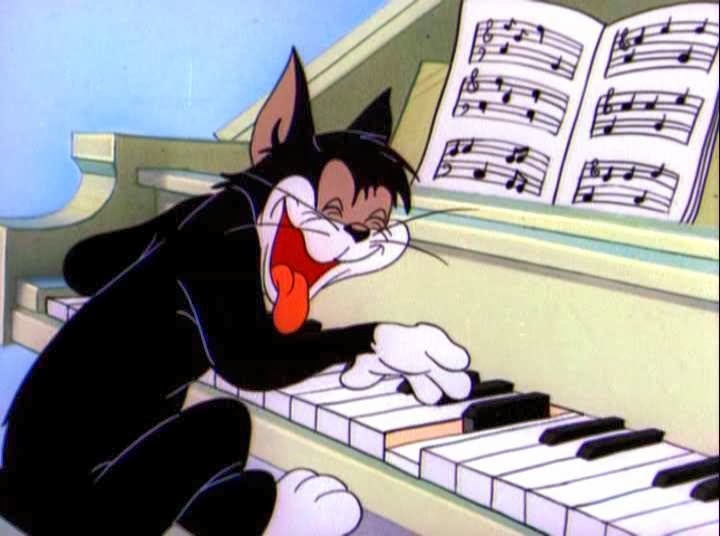 Butch is an alley cat with black fur and yellow and black eyes, he is the cat from the cartoon that stood the test of time; Tom & Jerry is etched in the minds of children and adults alike. The endless fun chase sequences with action filled traps and baits, kept us hooked to our television sets for hours. Though the show was generally famous for the titlular characters Tom & Jerry but there were their allies and nemeses that actually made the show more interesting than it already was. Butch is the leader of alley cats usually Lightening,Topsy, & Meathead who collectively with Tom take immense pleasure in troubling Jerry but at times acts as a rival to Tom just to impress the attractive feline; Toodles, whom Tom admires. They also have a fierce rivalry in the field of sports such as Tennis Chumps. 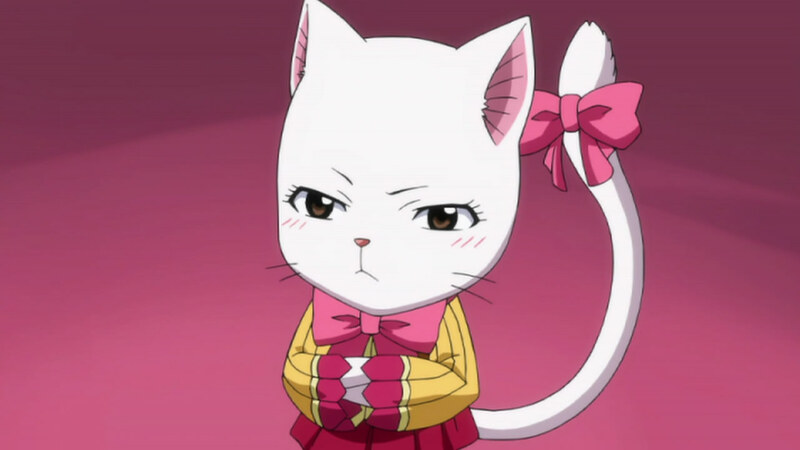 Carla is a cat like being called Exceed who lives on a fictional land of Edolas where Humans are considered an inferior species. She is a small white exceed with pink ears and brown eyes, she also has whiskers on her face like regular cats. She wears a pink bow tie at the end of her tail and whenever she uses magic, a pair of angel-like wings sprout from her back. Unlike other exceeds Carla is very aloof and has a reserved personality who refrains from showing any emotions. Cat is one of the two protagonists that the Nickelodeon’s animated show Catdog featured. He was known as James the cat and was very clever, he often exploited the Dog’s dimwit and made him do whatever he wanted. Cat is somewhat uptight and believes strongly in being polite, eating healthy, organized, and clean. 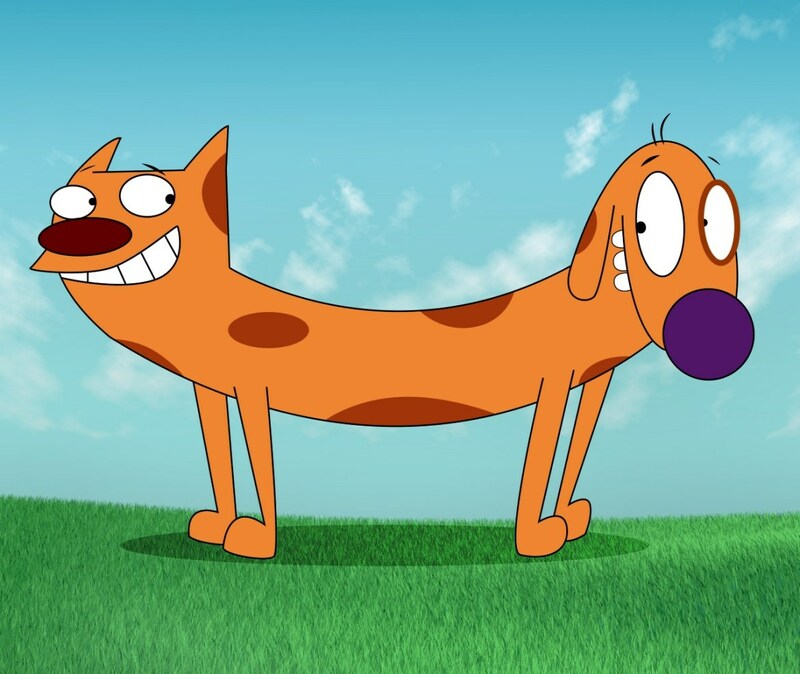 Catdog was portrayed as an unusual conjoined species where one half was Cat and the other was a Dog. So wherever one went, other had to follow, that is where Cat’s devious scheming mind trumped and helped him wander wherever he pleased against dog’s will. The Cat in the Hat is Dr.Seuss' one of the most prominent and recognizable work, it is a children's book written and illustrated by Theodor Geisel under the pen name Dr. Seuss and first published in 1957. 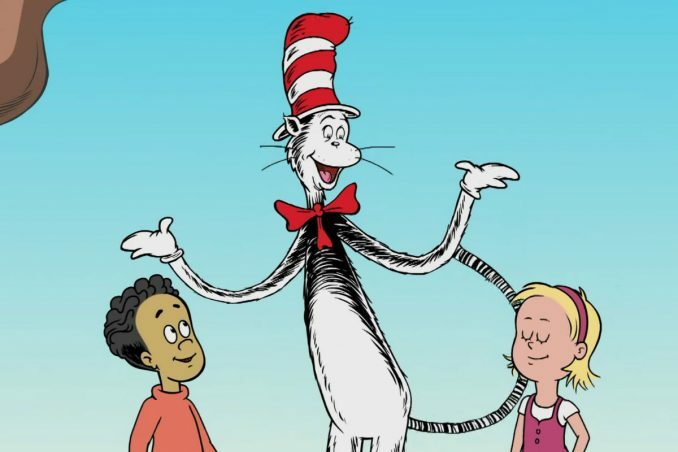 The story centers on a tall anthropomorphic cat, who wears a red and white-striped hat and a red bow tie. The Cat shows up at the house of Sally and her unnamed brother one rainy day when their mother is away. Catbus is a Cheshire-like cat which also happens to be a bus. Spotting characters like Catbus in a Ghibli Studio movie is not a strange sight, it is his unconventional and surreal work that makes it hard to forget the Ghibli characters. The Catbus also was known as Nekobasu (referred to in the film as 'Neko no basu') is a transporting animal bus looking character in My Neighbor Totoro. Chance "T-Bone" Furlong is one of the SWAT Kats, a pair of vigilante superheroes. He serves as the duo's pilot the Turbokat which he affectionately calls his baby. He is a cat with yellowish tanned fur and a muscular build. He wears briefs with Scaredy Kat Print, because he has a big link to his childhood. Chance is a fun loving, kind, and friendly cat. He keeps this up even when under the guise of "T-Bone". He's is far more "reckless" and a risk taker than Jake pushing the Turbokat to the limit, something Jake doesn't take too kindly to. Chaos naturally and instinctively causes exactly what his name suggests, so he thrives on the unexpected and unpredictable; he finds order to be boring. Therefore Chaos has made it his personal goal to cause as much chaos and mischief as possible; he does it all for fun, with a slapstick sense of humor that easily rivals, if not outshines, Genie's. Despite how dangerous he is however, Chaos is above Good and Evil, which he finds equally boring though he does seem to lean towards good as he intends no malice in his tricks, only to make them exciting and unpredictable. The Cheshire cat is a grey, light blue striped, turquoise eyed tabby fictional character from the tulgey wood forest in Wonderland. The cat sometimes raises philosophical points that annoy or baffle Alice. He only ever walks once, and that's when he looks back to Alice when he takes her to tea with the Hare and Hatter. His prefered mode of transportation is floating in the air and his disappearing abilities are described as ‘Evaporation’. Every kid wants a robot cat like Doraemon who will help him in school and to deal with his peers. He was manufactured on September 3rd in the year 2112, bearing the code MS-903, at the Matsushiba Robot Factory. His favorite food is Dorayaki (known as "fudgy pudgy pie" in the English version of the manga, "yummy buns" in the English, and "dora-cakes/bean jam buns" in other versions). 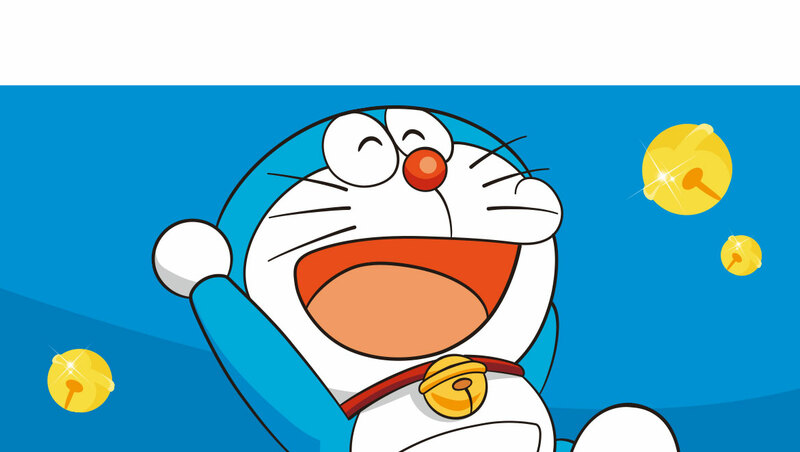 Doraemon also has a fourth-dimensional pocket on his body from which he can acquire various colourful, awesome and futuristic gadgets, tools and buy things from a future department store, mostly each one he acquires in each story are to help out Nobita Nobi with anything he has trouble with in the story. Duchess is very elegant, beautiful and ladylike, being the pet to an aristocrat. She is very devoted to her owner, Madame Adelaide Bonfamille. She is kind and friendly to everyone. She is both caring and protective towards her children and also tries to encourage them to develop into proper members of French society. She also has a great taste in music and presumably teaches her kittens to sing and play piano. 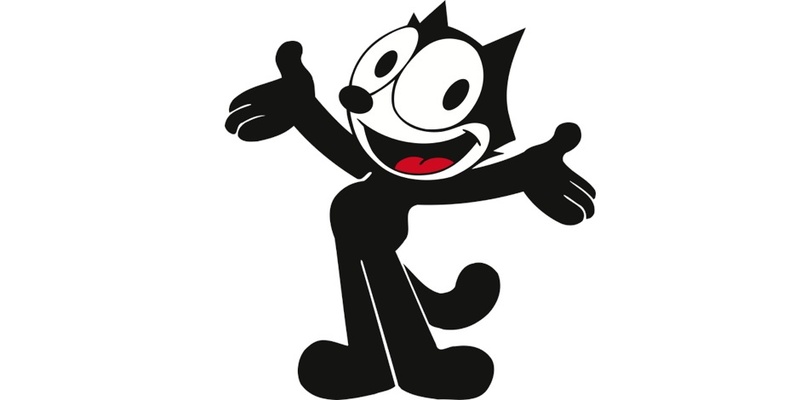 Felix The Cat is a very curious, mischievous and inventive little character as first conceived by New Jersey cartoonist Otto Messmer. He was more popular than the live silent movie stars and world leaders of the same era. His squat, angular, black body and huge, wide eyes and grin were instantly recognizable. He is considered the first true animated movie star. His first appearance was in a short film called Feline Follies. Soon thereafter he made the transition from screen to print. 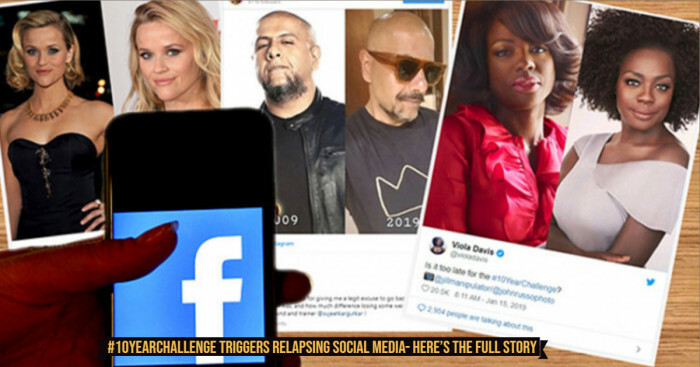 King Features syndicated Felix in over 250 newspapers in a multitude of languages, reaching practically every corner of the globe. Figaro was created as a supporting character in the 1940 film Pinocchio. 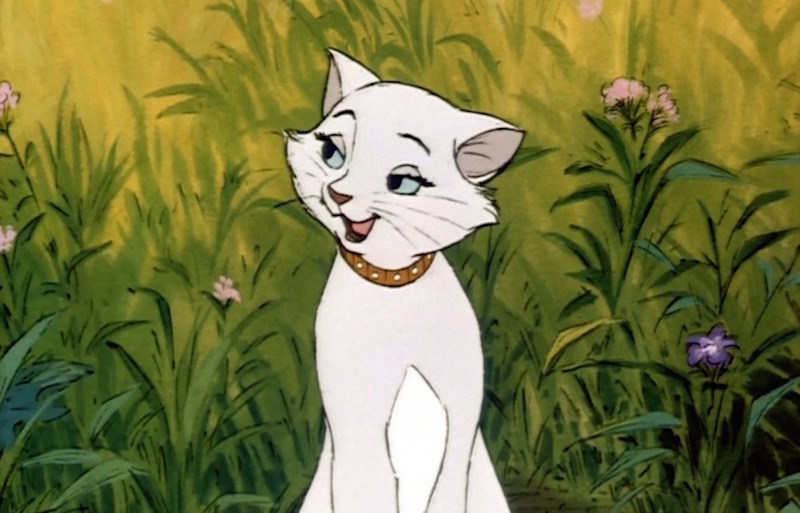 Like so many characters from that film, Figaro became a popular character with audiences. In fact, Figaro was Walt Disney's favorite character in Pinocchio, he loved the kitten so much, he wanted him to appear as much as possible. Once production on Pinocchio was done, Walt made him the pet of Minnie Mouse, replacing Fifi. Furrball is a cartoon character from the Warner Bros. animated television series Tiny Toon Adventures. He lives in cardboard box in the back alley or as a reluctant pet of Elmyra Duff. 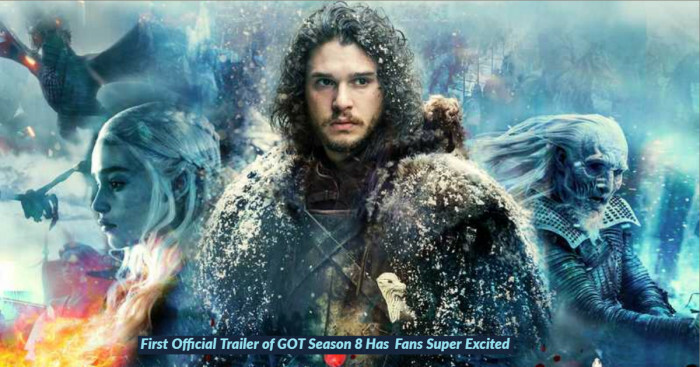 He is one of the main characters on the show. 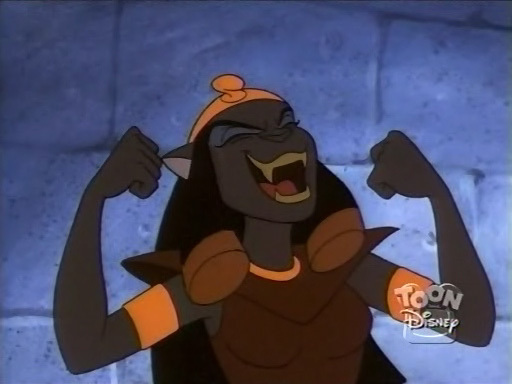 Furrball is voiced by Frank Welker. Furrball is a young, blue male cat with a hole on his right ear and a bandage on his tail. He attends Acme Looniversity and lives in ACME Acres. Furrball's mentor and favorite teacher at school is Sylvester, although the two similarities only seemed to include their appetites. 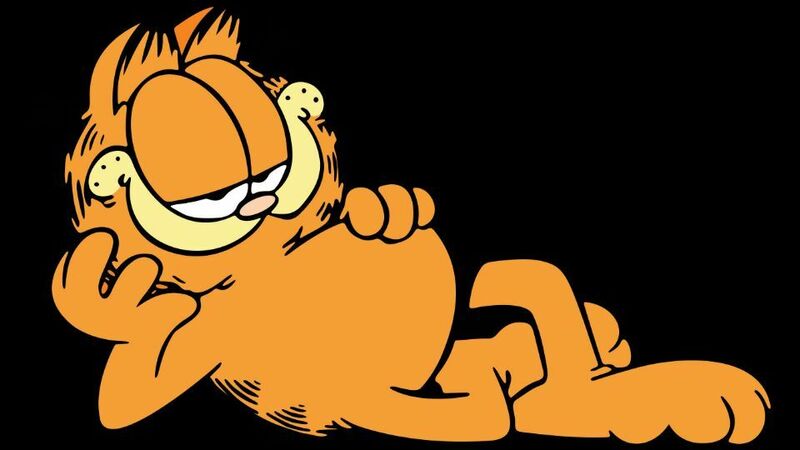 Garfield is an overweight anthropomorphic orange tabby cat noted for his sheer laziness, sarcasm, arrogance, selfishness, and intense passion for food, particularly lasagna. Apart from Raisins, health food, wax fruit, Jon's meat loaf, and mice he likes everything else. Often throughout the course of the strip Garfield's weight has been poked fun at as an object of ridicule, frequently by the electronic scale which he uses to weigh himself. 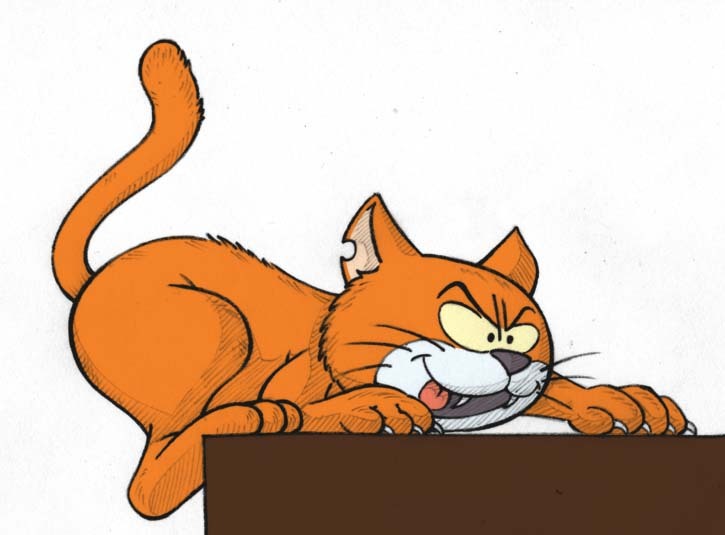 Heathcliff is an orange street smart, comical, and trigger-happy cat who spends most of his time trying to turn a dustbin over onto people's heads. Heathcliff is a street cat who loves to fight anyone but will not fight girls. He will also lie, cheat and steal to get himself some food, but despite it all, he is a good guy. He is always quick thinking of a trickster. 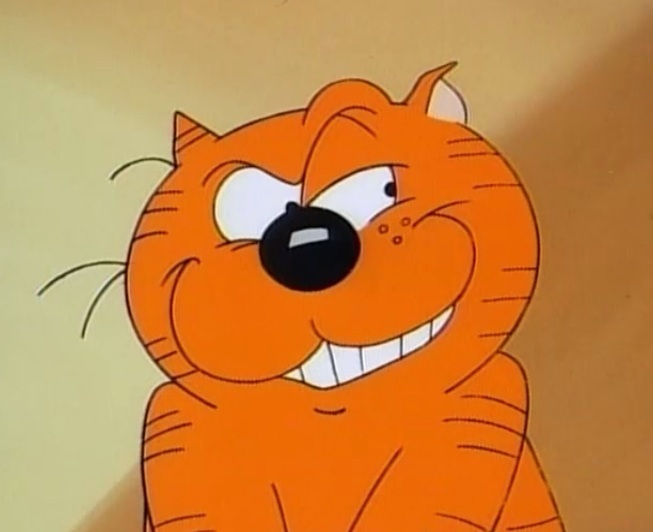 Heathcliff was voiced by Mel Blanc. 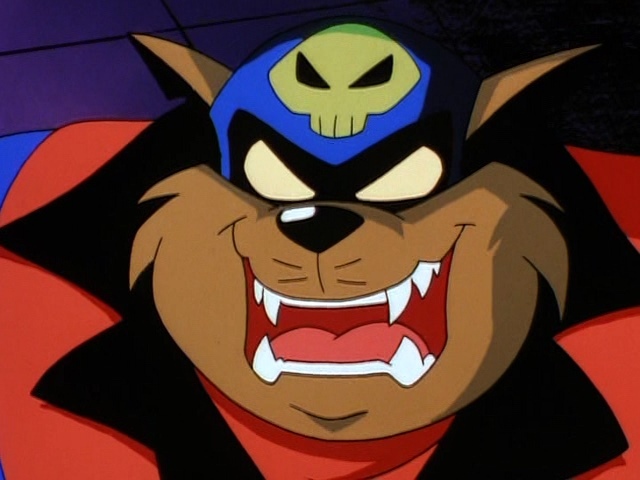 Jake "Razor" Clawson is one of the SWAT Kats, jet flying vigilante crime fighters, and serves as the duo's gadget maker/gunner and martial arts expert. He and his partner Chance Furlong also run the salvage yard which serves as their base and home until Season 3 Episode 12 they become Enforcer Pilots again. Jake is skinny and average size. His fur is rusty red. 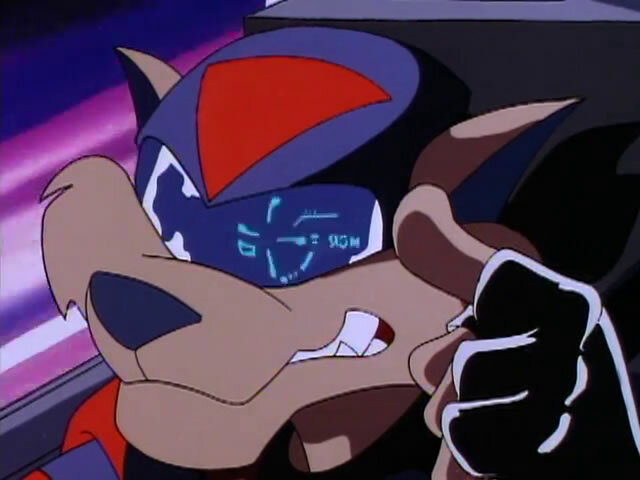 He is also the smarter and more athletic of the two, using his genius intellect to create all the weapons the SWAT Kats use during their heroic exploits and martial arts skills to use them. 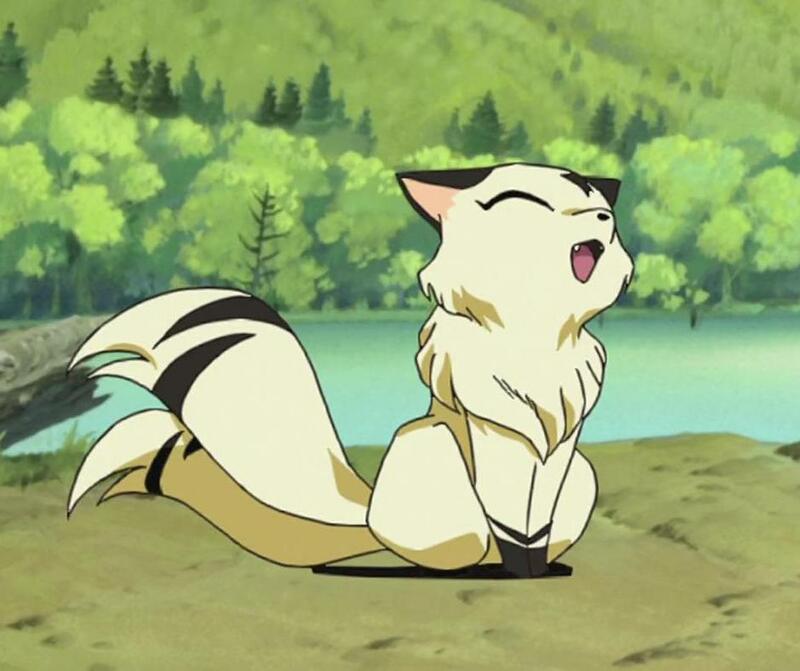 Kirara is a Nekomata; which is a fictitious being from the Japanese mythology. Nekomatas may look just like regular domestic cats but they have twin tails instead of one. She is currently travelling with Kohaku as a companion and partner, she also serves as a mode of transportation in the anime Inuyasha. 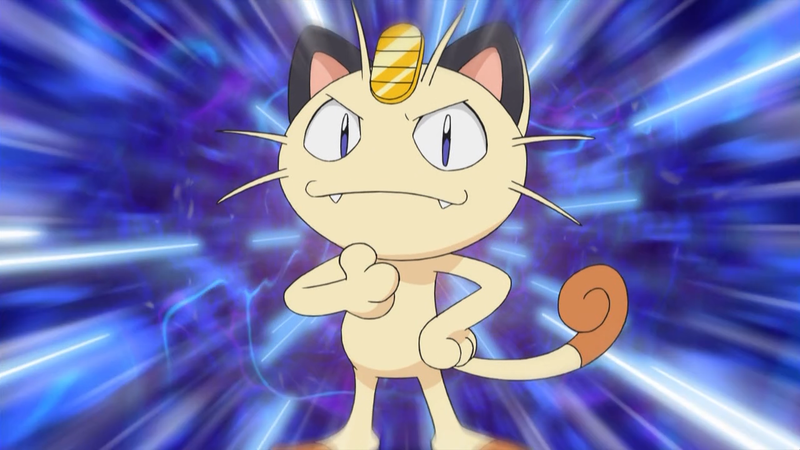 Meowth is a small feline Pokemon who also serves in a notorious trio Team Rocket alongside Jessie and James as an antagonist. They are always eyeing to fetch the Pokemons against their or their master’s will. 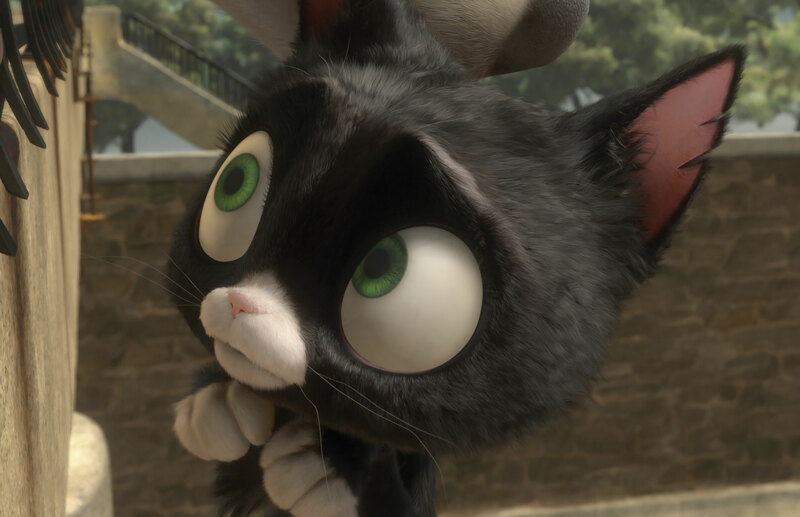 Mittens is the secondary protagonist of Disney's 2008 animated feature film Bolt. She is a sassy and short-tempered street cat who Bolt believed to be an agent of Dr. Calico. She is pessimistic and has a dry sense of humor. She lives the life of a thief who suffers from traumatophobia (a fear of battle and physical injury). 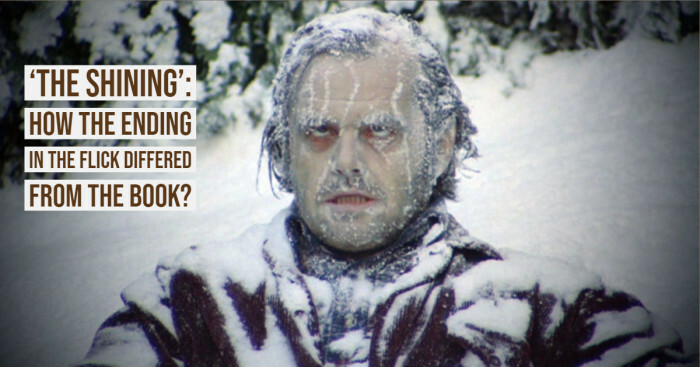 This Internet meme literally came out of nothing. Nyan Cat video emerged as a Japanese pop song with an animated cartoon cat with a Pop-Tart for a body, flying through space, and leaving a rainbow trail behind it. 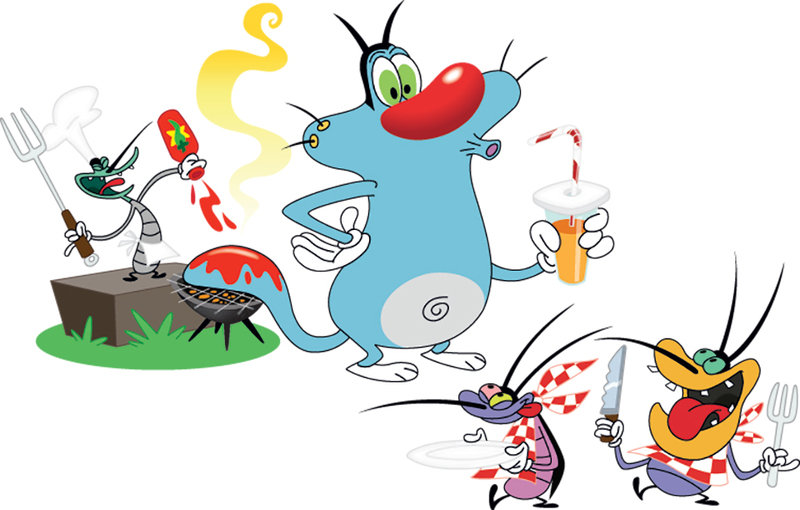 Oggy and the Cockroaches is an explosive cartoon featuring a cat with three pests—but this time, the victim is the cat himself and his tormentors are the cockroaches! He would be the happiest of cats if three cockroaches hadn’t settled inside his comfortable house. Oggy is a blue anthropomorphic cat who can’t relax even in his home just because the evil roach trio Joey, Marky, and Dee Dee won't let him. Peg-Leg Pete is a character of The Walt Disney Company and often appears as a nemesis and the main antagonist in Mickey Mouse universe stories. He was originally an anthropomorphic bear but with the advent of Mickey Mouse in 1928, he was defined as a cat. Puss in Boots is the tritagonist of the Shrek franchise and the titular protagonist of the film of the same name. He is one of Shrek's best friends/sidekicks with donkey and Humpty's brother figure. Sylvester is a fictional character, a three-time Academy Award-winning anthropomorphic Tuxedo cat in the Looney Tunes often chasing Tweety Bird, Speedy Gonzales, or Hippety Hopper. The name 'Sylvester' is a word play on the biological name for wildcats i.e Felis Silvestris. Thomas Jasper "Tom" Cat is a fictional character and one of the title characters (the other being Jerry Mouse) in Metro-Goldwyn-Mayer's series of Tom and Jerry cartoon show & movies. Tom & Jerry majorly relied on it’s slapstick humor and is also known for leaving a legacy behind in that genre. 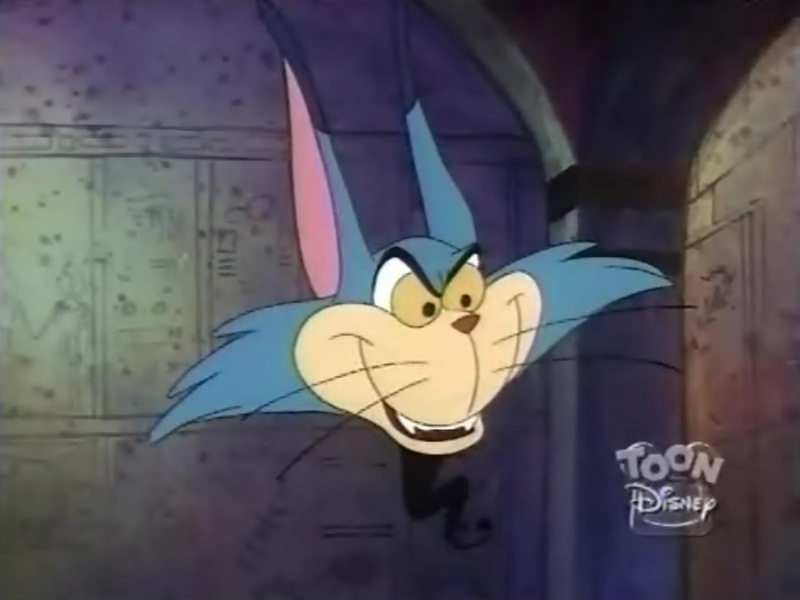 Created by William Hanna and Joseph Barbera, Tom is a blue/grey anthropomorphic domestic short-haired cat who first appeared in the 1940 MGM animated short Puss Gets the Boot. 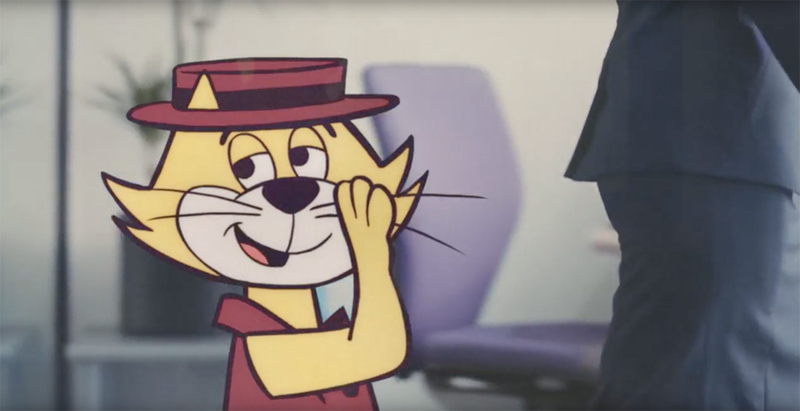 Top Cat (called T.C. by close friends) is the leader of a gang of Manhattan alley cats living in Hoagy's Alley: Fancy-Fancy, Spook, Benny the Ball, Brain, and Choo Choo. His get-rich-quick schemes are efforts to escape to a better life. The gang faces a human police officer who frustrates their efforts and keeps them trapped in the alley. He was voiced by Arnold Stang.